It is impossible to talk about Liz Larner’s recent installation at the Art Institute of Chicago, of two sculptures X and 6, without discussing the view of Chicago’s skyline. 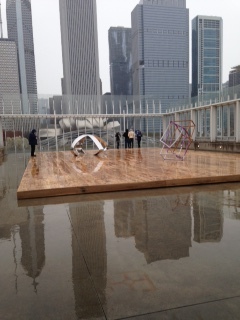 The installation both seamlessly fits in with and stands apart from the city skyline. Amongst the many grids and vertical lines in the viewer’s sightline, X and 6 become three-dimensional drawings floating in a gridded space. On a rainy day, the verticals begin at the viewer’s toes, in the reflections of the city buildings. The grid lines on the cement carry your eye to the hefty wood platform. These lines move into the metal rods on the terrace’s fence into the tall skyscrapers and back down again. Amidst the strong vertical pull, X and 6 become a place to rest your eyes. You can let your eyes wonder in, around, and between the curving lines of the two sculptures. The soft, warm appearance of the wood platform succeeds in creating a space of refuge in the shiny concrete jungle. The sculptures appear as giant toys in a play pin, stolen pieces from a utopian playground, or offerings to the great Chicago skyline. As mentioned in the installation text, the wood platform unifies the two pieces, and it does this very successfully. Without the platform, the pieces might seem too different or lost within the large rooftop space. While the installation creates a heightened awareness of its immediate terrace location, it also succeeds in linking with surrounding architecture. Without a doubt the strongest and most obvious juxtaposition is with sculpture X and Frank Gehry’s outdoor concert area in Millennium Park. Sculpture X serves as a mirror for the swoops of shiny metal atop the concert stage. The sculpture looks like those pieces were flipped around and set atop the wooded platform. 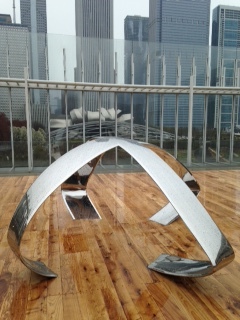 This piece also of course references Anish Kapoor’s Cloud Gate with the clouds being reflected in its surface. Isolated in a white cube, Larner’s pieces might be reduced to mere formal investigations, but atop the Art Institute terrace, they inform a larger conversation on architecture and installation. The fit so seamlessly, you might think they were built specifically for Chicago.